Emperor (with Matthew Fox and Tommy Lee Jones) is a needlessly boring and unjustifiably self-important melodrama that misses a great thriller right under its nose. Early in the morning of August 15, 1945, a group of young Imperial Japanese Army officers attempted to forcibly prevent the Emperor's surrender address from being broadcast that afternoon. It was an eerie repeat of the "February 26  Incident" (and even the Satsuma Rebellion in 1877), when a similar coup d'état was launched with the goal of "purging the government and military leadership of their factional rivals and ideological opponents." The "August 15 Incident" ran out of steam when die-hard War Minister General Korechika Anami refused to lend his moral or material support (unlike Saigo Takamori back in 1877, whose participation ensured a lot more people dying for no reason). The best cinematic account of the events of August 15 is Japan's Longest Day. 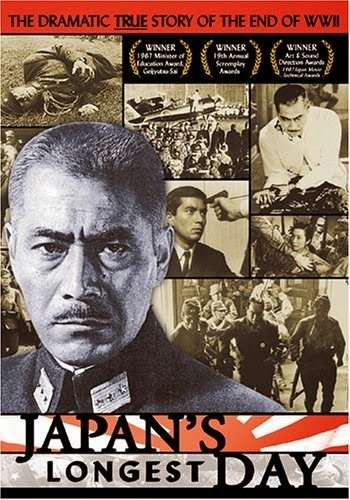 Kihachi Okamoto's 1967 docudrama (based on the book by Kazutoshi Hando), with Toshiro Mifune as General Anami, is rather too hagiographic about Hirohito's role. But it faithfully portrays the suicidal spasm of fanaticism that ended the war for good. What makes it all the more fascinating is that, almost immediately following a "war without mercy," the war did indeed end for good, as John Dower lays out in detail in the best history of the Occupation, Embracing Defeat . Popular culture perhaps makes an even stronger argument. A number of surprisingly decent Hollywood movies—fair and fairly accurate—with marquee stars were set in—and even made in—Japan not long after the end of the war. Go for Broke! (1951, with Van Johnson) is about the 442nd Regimental Combat Team, composed of Japanese-Americans. They fought in Europe. It depicts the Nisei soldiers in a quite positive light. The screenplay was nominated for an Academy Award. You Only Live Twice canonized the silliest of modern stereotypes about Japan. Japanese audiences, though, were delighted with the whole thing. The same can be said about The Last Samurai, which is about as historically insightful as an old western B movie. It seems a little Orientalism can be good for art. I'm sure Hollywood found the "exoticism" of Japan fascinating. But it was exactly this fascination that allowed them to take the non-exotic parts at face value, rather than filter them through their own biases.